I am not usually in the market for chocolate chips. It's just not found in the kind of baking I tend to choose to do. I am haunted by the memory of a childhood full of very bad baking chocolate, nothing like the artisinal and quality products I am more used to today. Maybe the good stuff was actually available back then, I am not sure? If it was, it certainly wasn't on my radar and it was undoubtedly too expensive for my mother to buy. The Baking Chocolate I grew up didn't taste so great on its own, which I am sure was another reason for her purchasing it - it stopped the kids from wanting to pilfer it from the pantry. Last year I donated a prize to Menu for Hope, whereby I promised I would bake the winner a batch of Wookie Cookies using locally sourced or organic ingredients, where possible. It was baking those cookies last week, that led to my discovery of Guittard Real Milk Chocolate Chips. We all know that it is the Chef's duty to try the food as they work, so I popped one of these larger-than-average buttons into my mouth. Mmmmm. I am usually more of a darker chocolate fan but these Guittard Milk Chocolate Chips were totally dreamy, smooth, creamy and thick with chocolate and vanilla. If you're a(n old) Brit you might know what I mean if I say they are more like a sorely missed Galaxy Counter than a chalky, too-sweet Cadbury's Chocolate Button. Needless to say, once the necessary amount of chocolate chips had been weighed out for the recipe, the rest of them didn't survive much longer than a day or two. Sigh. These things are really tasty! And quite rich for chocolate chips: first time I tried one, it was a surprise. Galaxy Counters! I'd forgotten they existed. These sound interesting - I'm no milk chocolate fan, but tried the Green & Blacks version recently and it was sublime - can you get that over there? sam you are right on both accounts a) too poor but also not the choice there is today b) didn't want you and beccy eating it all while I was at work (I have a very good selection in my cupboard now e.g. green& black's organic. Anyway correct me if I'm wrong but bad as the choc may have been I don't ever recall you refusing to eat it!!! where did you buy them? i don't have a trader joe's or whole foods or anything down here (champaign-urbana, Illinois). Oooo. That's my preferred brand of chocolate on the rare occasions that I bake with it. 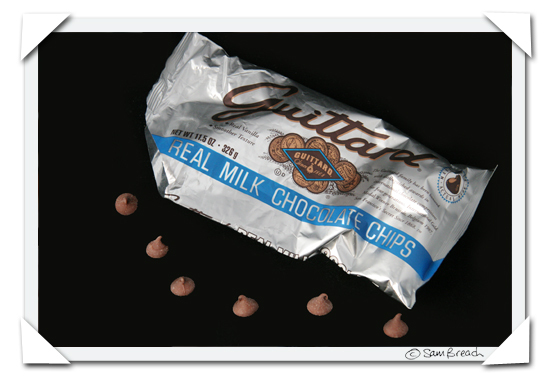 Yes, I do love Guittard milk chocolate chips--MUCH more than nestle semisweet! Ohhhhh, the fabled Guittard chips! I was once given a bag as a present from a friend who lives in Oakland. How I would love to go to the supermarket and just buy a bag. Stupid lousy New York City supermarkets. oh i love those chips! very nice in cookies.... or right outta the bag. thats what i buy in cali! Yes, I had a bag of those in the pantry, reserved for baking. But, my husband spied them and now they are gone! Now I know to hide them. They would not have lasted five minutes in my chocoholic household. Probably a good thing I am all the way on the other side of the world, so they don't add to my squishyness. I have ordered from them, fingers crossed there products are as good as they look.